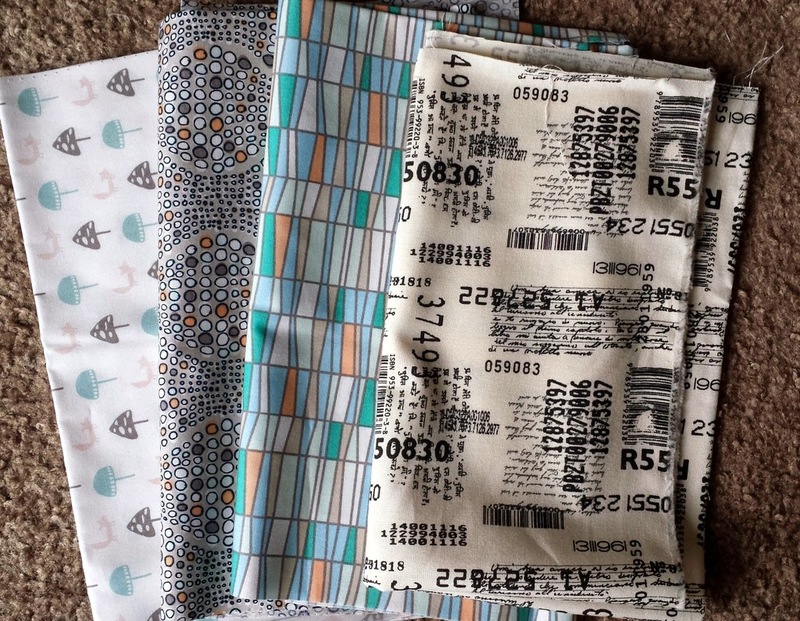 I recently acquired some beautiful, soft Indian Summer cuts (Sarah Watson for Art Gallery) and the awesome Zen Chic barcodes (Comma). All four are fat eighths (a couple are about an inch bigger) - a nice little bundle for a lucky winner. The barcodes even kind of go with the Indian Summer. :) For the next big giveaway day, I would like to make a handmade item; I just didn't have a chance to make something this time 'round. For a chance to win the fabric, tell me where you would live if you could - whether it be on this earth, or a certain time period, or a place in a story or movie. Personally, I would be more than a happy hobbit if I could just hang out in Hobbiton for the rest of my life, enjoying good food, friends, and flowers. One comment/answer per person. Followers get an extra chance - just throw in a second comment and tell me how you follow! I will ship internationally. The giveaway closes on Friday, May 16 at 8pm EST. I will choose a winner via the Random Number Generator (or another creative way if I can muster up the energy on Friday), and I will email them! I usually respond to all comments but giveaways get overwhelming, so I may not get to them all. I'd be very happy living in the San Francisco from Nalini Singhs Psy/Changeling series. Fun fabric. I'm pretty happy in the present but I think the 50's and 60's might have been fun to experience. I think I'd also be happiest in the present but I do think living in the Caribbean during the pirate reign around the turn of the 17th century would have been fascinating. Though as a lady I'd hope to be there under strictly business circumstances and I like to believe I'd have made a darn good lady pirate. If you're gonna be a Hobbit, I want to be one too--so long as I get to have a sewing machine ;-) Also, hobbits don't have to shave, right? BIG plus, haha...and they eat all the time! Yeah, I'm totally there. I follow/borderline stalk you through various avenues. I could quite happily live in the Shire, I'm only 5 ft tall so wouldn't even have to duck going through the doorways into Hobbit homes! I'd live in the Caribbean (probably Bonaire) so I could SCUBA dive more often! Lovely fabrics. Love this question but I don't know the answer! I love Jane Austen novels and the romance of them but the reality of draughty houses and terrible plumbing is no fun - I'm a bit of a realist! I'm quite happy living in the here and now although to enjoy life before children again could be great! I would live somewhere on the beach on Lake Michigan. I currently live about 40 miles from the beach - best place in the world. thanks for a chance to win. I would love to live half the year in Europe and half the year here in New Zealand. 6 months in each European city would be my idea of a perfect life. As a bonus it would also be a perpetual summer. I would go back and live in The Little House On The Prairie Days until I started wanting a milk shake and a hamburger:) Oh and realized how few choices women have. I would live in Southern England in a small town, about 60 years ago before cells and computers and such the like! I have always dreamt of living in New York. I actually live in New Zealand, and the hobbiton film set is about 2 hours away. Come for a visit. I am happy with where I am right now, although moving to the beach some day would be nice! First thing I thought of was "Anne of Green Gables"--that time, that place, and at that pace. We live a quiet country life in the Pacific Northwest, so it wouldn't be a h-u-g-e change, but I think the "peaceful" and "slow-paced" aspects would be magnified, which sounds so good to me. I wouldn't mind living on a tropical island where it is warm all year long....as long as there were no hurricanes! Thanks for the giveaway! I follow you via email, and I love seeing your projects--I learn a lot from your choices of color and design. The roaring '20s might be fun! I love the style of dress back then! I would live with the elves. I would live somewhere warm and near the ocean! I lived in the San Francisco area for several months, and it was so wonderful! I would live in Alaska again. I love it up there! Hobbiton sounds wonderful to me, too, but I would also love to love by the ocean. I love the sound of the waves breaking on the beach. Thanks for the chance to win your beautiful fabric! I would like to live someplace just slightly warmer and by the ocean, maybe like Sacramento or Washington state. Great question - I think I would like to live as a pioneer woman - living off the land and making all my own things like candles, rag rugs, clothes from potato sacks!!! Yay I am a GFC follower :) Happy giveaway week!!! We've had our chance to relocate when we retire, and we've chosen to live right where we are, near Sun Valley, Idaho! We live in the mountains, have fantastic winters, gorgeous summers, short springs, and unbelievable falls. And the people are the nicest you'll find anywhere. Yep - I'm okay right where I am! I would go home and live in New Zealand, Titirangi Auckland - I think will be my destination :-) Close to beaches, the bush and then also close to the city. I think I would like to live in England or Scotland as my family came from there, maybe in the 50's or 60's. After this last North Dakota winter anywhere warm, like Hawaiii. Although the shire would be a nice place, I would choose Rivendell. Lovely fabrics!!! I would enjoy living right where I do , in Michigan. Such gorgeous pretties!! If I could live anywhere it would be right where I am now, I have a loving family, and great friends, I don't think there is anything much better than that! I'm gonna cheat and say I'd like to live in the Tardis- that way I can visit any when/anywhere. I'm too flighty to commit to any one time or place! Then again, in one Heinkein book there was a planet where all the best fictional characters mingled with the "real" folks, I'd like to go there, too. Thanks for the fun question, and the giveaway!! Now that's an interesting question! Somewhere warm, but with easy access to winter conditions so I can still go snowshoeing sometimes. Oh, and I love dragons, so maybe they could live with me too? Pretty sure I'd have to create my own world! Those fabrics are so pretty. I follow on Bloglovin as ogggirl, and I would like to be right here, right now - with the love of my life, planning our move to Maui in November! I would live in harry potters world! I have been following you via bloglovin for a while now. That's an easy question, I would love to live in a house right by the ocean, preferably a really wild part of the coastline as I just love to watch the waves crashing in. With a giant window in my sewing room overlooking it all of course! I'm a follower already via Blogger. Thanks for a lovely giveaway. I'd live on a quiet cul de sac where all my college friends lived as well. We'd be able to spend as much or as little time together as possible! Can you tell we're all spread out and don't see each other often enough?! Can I ask for the Tardis during Doctor #10? I would love to live in Hawaii, somewhere not in a big city. Or really on a small homestead with a few animals. I would live in Iowa. Is that weird? It's home to me, although I've been away for 8 years. :) love the fabric- thanks for the giveaway! I'd live in Mindy Lahiri (of the Mindy Project)'s apartment. SO LUX. I would like to relive the late sixties, early seventies! Everything was possible and there was hope for the future! I would live right where I'm planted--in Woolly Hollow State Park in Greenbrier, Arkansas. This beautiful little lake and state park has been home for 35 years. Why live somewhere else? My children and grandchildren live close. It is paradise. Anywhere my family is would be paradise. I'd like to live in a big farmhouse with a wrap around porch, animals and plenty of land and not have to ever go to work! I would like to live in Michigan in the summers in a lovely cottage on Lake Michigan. I love South Haven. In a perfect world, I would live somewhere in the Irish countryside. Thanks for the chance to win! I agree, I would love Hobbiton. I'd like to live in the wizarding world of Harry Potter! I want to go to Alaska. I am not sure if I want to LIVE there since I have never been, but I certainly would like to visit. I would love to live in Pleasantville (a perfect 50's Americana town!). Thanks for the chance! Interesting question. I think I would live in a land where I could ride on a dragon, but then again, I would also be happy living near ocean cliffs. I would love to live on the beach in Fiji! Thanks for the giveaway! I would love a cabin on the beach- Oregon or any beach. I like where I am now, but I would change the temperature downward in the summer. I would live where I am, but have the ability to visit my sisters and other family more often! I love living in the present and in the best place in the world. Paradise :-) Thanks for the giveaway! I'd love to live somewhere where the temperatures were in the high teens to low/mid twenties Celsius every day with lots of sunshine and not too much rain. Don't think such a place exists! I would live in the 19th century in the hamlet, Larkrise from the British series, "Larkrise to Candleford"
Thanks! I wish I could live in a neighborhood with all my friends and family in close proximity...instead of all of us being scattered around the country. I would live near the ocean. Somewhere near my children. I couldn't imagine living anywhere but Wales! I would so like to live by the sea, in Norfolk, England. I'm actually pretty happy here is Snohomish, WA. I would love to live in an island with many other lovely people. maybe some quilty people too. I'd like to live somewhere warmer than Tasmania is becoming right about now! Preferably much closer to my sister and Mother who live interstate, are hard to get to visit and very much missed. Thanks for the giveaway Jess! Loving your medallion and how scrappy it is. I love Sydney so so much, and coming from Oklahoma I couldn't imagine living in another city. I would like to check out how gay life was throughout different periods of history though. That would be pretty cool to see how I turned out! Definitely in Naboo, gorgeous place ever! Beautiful fabric and blog, by the way. One day I would like to live by the sea but for the time being I'm pretty happy living in London, UK! I'm happy with the here and now but I wouldn't mind living closer to the sea! Maybe in Boston or somewhere in Canada! But if I can choose a period in time.. I would like to go back to the Victorian Era (LOL.. my hubby always laugh at me.. cos he said most likely I will be a peasant's daughter and nothing much to eat) okie.. maybe not then.. I would love to live in Ireland, but I am happy with my livingplace. Anyplace or time there is a flushing toilet and a hot shower will be good for me. I'd want to be on of the rats from Nimh. So smart! I would like to live in Asia. I"ve always wanted to go to Cambodia, to help orphans. Thank you. I like the time we're in, hello computerized sewing machine, but I'd pribably move from Iowa. I'm nit a big fan of the snow and tornado seasons. I would like to live in the Northeast along the shoreline for a short time. Then I'd be happy back in Kansas. Thanks for the great giveaway. I am already a follower with Google friend connect. I found you through IG and I follow you there @agalinsweden but you are in my Google dashboard too. I love the colour combination in those fabrics! It looks a lot like my elephant fabric which is pretty cool! I follow via Digg Reader! This SMS giveaway day has been absolutely awesome in finding wonderful new blogs to follow! So much inspiration! Living in Kilkenny Ireland, totally love your stuff. I've lived in the Netherlands for a year, and would love to live there for much longer. and I'm a new bloglovin follower - that medallion quilt is BEAUTIFUL. wow, can't wait to dig around your blog more! I'd go back to 1950/60's. Back when family was what it was all about! I think it would be nice to live on a cruise ship and just travel around soaking in the rays! I grew up watching Anne of Green Gables, so I'd really love to live for a little bit on Prince Edward Island -- or at least take a vacation there. I follow on Bloglovin. Thanks for the chance to win; I'd love to add some low volume fabrics to my stash. Love this fabric!!! Love your blog!! I would happily live in London and be fairly well off so I could enjoy the theaters, restaurants,art galleries,and craft shops. Hmm, good question. I think I'd be able to live happily in It's a Wonderful Life or maybe Bug Bunny! I grew up in England and now I'm in the US. It would be nice to live in New England, somewhere beautiful and somewhere that reminded me of England. What I'd really like is for the countries to be closer so it would be easier to visit! I would love to leave somewhere warmer and you could have snow only during Christmas! I'd love to live on another planet. I would love to live somewhere in the mountains in a log cabin next to a lake. I would also love to live in the beautiful country side of Scotland or Ireland. Thank you for sharing! I would love to live in Paris or be a character on Downton Abbey. I love where I live and the forest behind my house with it's lovely trees and all sorts of critters and birds bring everyday joy. Hear, hear. I'd rather read blogs than instagram, I'd love to live in Moscow, Japan or New York. Hobbiton would be too dangerous for me! I`d love to live in Malaga,Spain with it`s beautiful and spectaculars beaches ,mountains and food. Wow! I'd love to live in Europe. But always thought I was born during the wrong time, about 100 years to late. Of course, living with Hobbits would also be wondrous. Living with Thor might not be bad....maybe we shouldn't go there. I am more than happy living were I am. Canada. Thanks for the chance to win. I'm happy living where I am. Although during our recent endless winter I was thinking I should move somewhere tropical!